Hailey Rodeo Arena hosted the fifth of six 5th District High School Rodeo spring competitions last Friday and Saturday in cool weather. Remaining in the season overall lead after solid weekends at Hailey were Dietrich Rodeo Club cowgirl Katelyn Perkins and Valley’s Cody Ruby, just 29 points ahead of Gooding’s Wyatt Williams. Carey Rodeo Club’s Kylie Castle had a number of point-getting efforts including fifth place in Saturday’s goat tying (11.36 seconds) and seventh in Friday’s goats (10.30). Matt Whitworth of Carey stopped the clock at 26.38 seconds in calf roping Saturday for third place in that event. Kali Castle of the Carey Rodeo Club enjoyed a good weekend in breakaway roping with fourth place Friday night (9.10 seconds) and sixth place Saturday (6.02). She was ninth in goat tying Saturday (12.95) and eighth in goats Friday (10.50). Sarah Rau of the Wood River Rodeo Club placed ninth (17.127) and Fairfield’s Adriane McGuire 10th (17.226) in Saturday’s barrel racing. Another barrel racer, Fairfield’s Whitnee Hurless, finished fifth Saturday (16.783) and fourth Friday (16.470). Junior high school rodeo contestants in Hailey included Payson Bennett of Bellevue, Harlee Manning of Hailey and Dani Aiken of Carey. The 5th District Finals Rodeo is Friday and Saturday, May 23-24 at Gooding, with Saturday finals at noon. 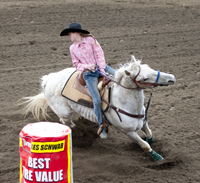 Idaho State High School Rodeo Finals are June 8-14 at Bannock County Fairgrounds, Pocatello.